By Tom Stoppard. Directed by Hannah Bennett. 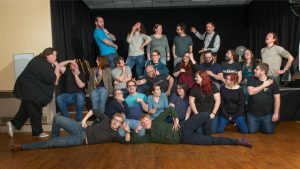 21st – 23rd February 2019, The Paget Rooms, Penarth. At Sidley Park in 1809, the house is rife with intrigue and happenings, as the infamous Lord Byron is staying with the Coverly family. Whilst the gardens are being redesigned – much to Lady Croom’s distress – the youngest daughter, Thomasina, is being tutored in the classics by Byron’s contemporary, Septimus. Two centuries later, a group of academics convene at the same location to discuss the events that followed: did Byron take part in a fatal duel? Is the story of the mysterious Sidley Park hermit really just a myth? And who was spied with Mrs. Chater in the gazebo? 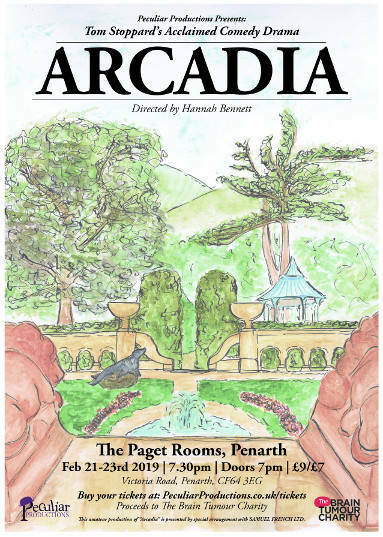 This amateur production of “Arcadia” was presented by special arrangement with SAMUEL FRENCH LTD.
More information about this production will follow shortly. By Terry Pratchett. Adapted by Stephen Briggs. Directed by Ellen Warren. 22nd – 25th August 2018, The Gate Arts Centre, Cardiff. Wiliam de Worde is one of life’s Observers. He’s always been very good at it. So much so that he’s just managed to invent Ankh-Morpork’s first newspaper, and now his observations are everyone’s observations. This has the unfortunate side effect of People suddenly Observing him. With a scandal causing chaos in the highest echelons of society, political uncertainty abounding and a lot of funny shaped vegetables, William finds himself right in the middle of the story for the first time and unsure of which way to turn. All he knows is that he has to find the Truth. 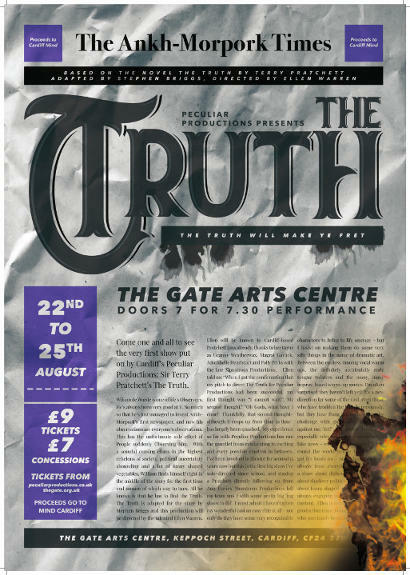 The Truth was Peculiar Production’s first show, and raised £5,000 for Cardiff Mind.